This is a monthly series in which the Attorney General will feature a Vermonter doing exemplary work in their community. Have someone you think should be featured? Email AGO.CAP@vermont.gov. We are honoring, as our February Vermonters of the Month, the 271 volunteers who generously give their time to Vermont’s Court Diversion programs. This year, Vermont Court Diversion programs celebrate their 40th anniversary. Court Diversionis a restorative alternative to the traditional criminal justice system for individuals charged with a crime. After police issue a citation for violating the law, the state’s attorney decides whether to refer the person out of the court system to the community-based Court Diversion program. Volunteers are a critical component of this program’s success. They meet as a restorative panel to hear the needs of victims, learn the underlying factors in the individual’s life that contributed to the crime, and create an opportunity for the individual to take responsibility for their actions, repair harm to victims, and rebuild connections to their community. 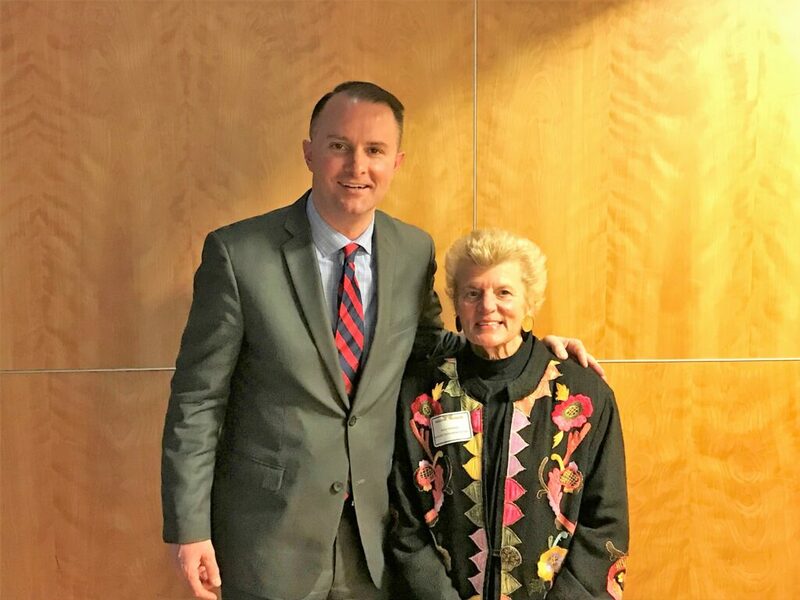 We had the pleasure of speaking with two amazing volunteers, Anne Conway of Lamoille Restorative Center and Linda Brown of Windsor County Court Diversion, about their experiences with Court Diversion and to learn about what drives their passion for volunteerism. Born in Hardwick, raised in Morrisville, transplanted to Boston—Anne Conway returned to Morrisville after 28 years away from her home state of Vermont. Anne has been actively volunteering in different capacities for nine years and was honored in February as Lamoille County Chamber of Commerce’s Volunteer of the Year. Court Diversion follows a restorative justice model: what does restorative justice mean to you? I’ve seen people who’ve made unwise decisions and hurt others, as well as themselves, take responsibility for what they did and then repair that harm. To me, that is restorative justice. How has court diversion/restorative justice impacted your community? Ultimately, it helps to make our community safer. I have personally witnessed individuals who have valued this second chance provided by Diversion and moved forward in their life on a positive path. Can you share a story of a memorable panel meeting or related-experience that has had a lasting impact on you? I remember one participant who had allowed alcohol to become foremost in their life – this led to an arrest, an unpleasant divorce, divided custody of children, and the destruction of their career. One part of the person’s agreement was to write a letter of ‘apology’ to their family. When the participant returned for the second visit, they read a very sincere and touching letter of apology, regret and resolve. In addition, the person had found a part-time job and was in recovery. As a panel member, I valued seeing the positive results of our program. Reflecting on your experience as a volunteer, have you observed a change in the program over the course of your experience? I have seen more creative ways for an offender to correct the harm they did and improve their view of themselves and the community in which they live. What impact, if any, has being a Court Diversion volunteer had on your life? The most satisfying aspect of my panel participation is that I am reminded that we are all in ‘this’ together and that we can make a difference in the lives of others. Like Anne, Linda Brown was born and raised in Vermont but left the state as a young adult to pursue a career in New York City. Linda returned to her hometown of Springfield after 30+ years away to care for her mother. Since then, she has been volunteering with the Court Diversion program for more than 15 years. Panel meetings are all very interesting, but the thing that had the most lasting impact on me was a dynamic class given to us volunteers called “Bridges Out of Poverty.” It helped me to understand many of the people who come to Diversion and increased my level of compassion for them. I truly believe we must have compassion to work well with people. Restorative justice means to me that a client admits his or her mistake and does something, such as repaying victims or writing an apology letter, to make things right as best they can. I believe all these actions can imprint in a person’s brain and reduce recidivism. And, it certainly helps reduce the backlog of cases in the State of Vermont’s court systems. The most notable change in Court Diversion for me was when participants started to stay in the room while we discussed the restorative agreement. When I first started to volunteer, after we had met with the person, they would step out while we developed a preliminary plan. At first, I did not like this new way. However, I now feel that the participant is more apt to complete the contract that he or she was involved in making. My advice to others looking to make an impact in their community is to volunteer! Are you interested in becoming a Court Diversion program volunteer? Contact your nearest program to learn more. Our January Vermonter of the Month is Kim Souza, founder and co-owner of Revolution, a consignment and thrift shop in White River Junction. Business owner, select board member, community activist, and all-around dedicated neighbor, Kim Souza started Revolution in White River Junction, Vermont 17 years ago. Kim was makes running a small business in rural Vermont look easy. Kim’s creativity in expanding her business, perseverance, and commitment to the wider Hartford community is why she is our January Vermonter of the Month. How did you end up in Vermont and what made you stay? Born in Rhode Island, and raised in Canaan, New Hampshire, I developed ‘Vermont envy’ in my teenage years. Having grown up in rural New Hampshire, I embarked on the classic early 20s cross country adventure, only to be offered the most promising professional opportunities right back here in the Upper Valley. What have you learned from your work as a small business owner? Has it changed your perspective on your community? I’ve definitely learned that operating a small business is more about maintaining a wonderful quality of life than it is about financial security. My previous career path had been satisfying and fiscally sustainable, but something was missing. In that experience, I was selling my time in exchange for a sense of security for my family. What I was lacking was precious time with my new child and a sense of joy in my day-to-day movements. In the small business world, eventually, I was able to coordinate a schedule that allowed me to spend more time with my son and to connect, face to face, with the charming White River Junction community. After 16 years, I still love coming to work every day! That is my personal success. What made you start a small business in White River Junction Vermont? I returned to New Hampshire from Los Angeles with two job offers and chose one that I enjoyed for 12 years. I worked with a fledgling educational travel company as an administrative assistant in a company of two employees; myself and the owner. Ultimately, I learned every aspect of that small business, from bookkeeping and marketing, to sales and program development as we grew the company together. I considered my experience there to be the equivalent of an MBA when I left the position of Senior Vice President in 2002 to pursue something more suited to my creative social strengths. Briggs Ltd Department Store closed after 50 years of retail operation in April of 2002, and I opened Revolution that June in that location– across the street from one of the two White River Junction strip clubs! With my first business plan complete, I was convinced that what I would save on rent, I could spend on marketing and become a destination location. The strip clubs have since closed, and after many years of ‘one-step-forward-two-steps-backward’ development, our village has grown at a healthy pace with attention to keeping our ideals at the center of our goals. I have never regretted the decision to open my small business in White River Junction! We love your “White River Junction- It’s Not So Bad” T shirts. What is the story behind this? 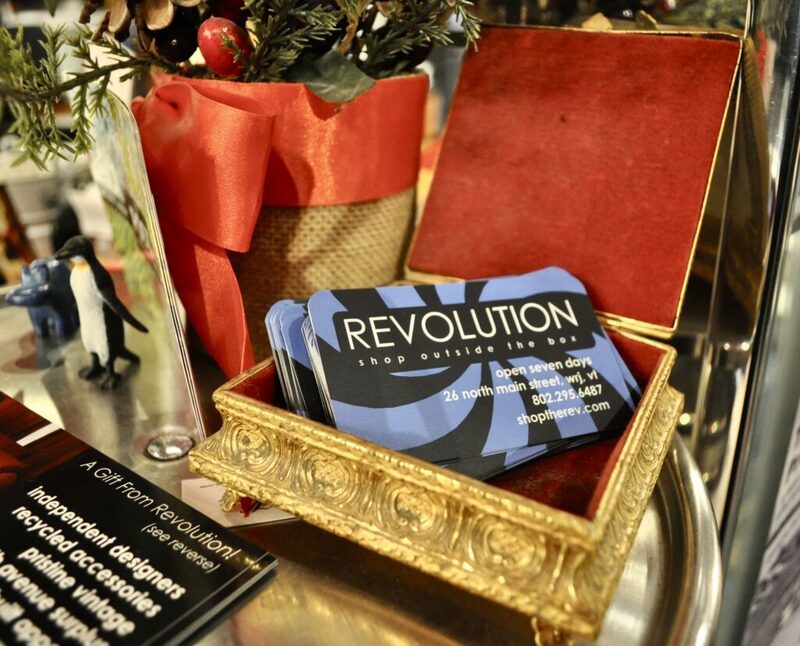 A lot of organic idea sharing happens around the espresso counter at Revolution. I’m pretty sure it was one of the stream of consciousness taglines that friend and local developer, Matt Bucy coined. Another one of my favorites of his is “White River Junction… Coming Soon!”. The ‘…Not So Bad’ tagline just kind of caught on. One common thread among the downtown White River Junction community members is that we like to do things because they feel good and we try not to take ourselves too seriously. I think the tagline sums up that sentiment. What impact has your store had on your community? One surface impact that Revolution has on the community is simply our willingness to hang in there. The store was notfinancially sustainable in the early years, and I planned to close in 2006. Again, I felt as though my experience had served as a supplement to my ‘education’ and looked forward to my next move. I was fortunate to have been offered some decent positions as a result of working multiple part-time jobs while attempting to raise my son and keep my business afloat. I had options. 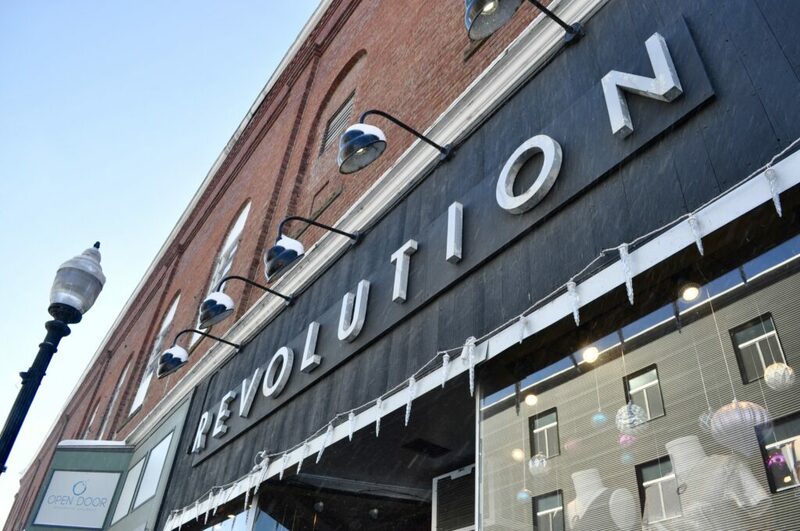 And then… A local family approached me and asked, “What would it really take to keep Revolution open?” This was pretty remarkable considering that this was simply a funky little used clothing store in the middle of a defunct railroad town. After many cups of coffee and various spreadsheets and projections, we came up with a figure. The figure was substantial and, I asked, “why don’t you just buy my business from me instead of investing in one with a partner (me) who brings only debt to the table?” My (now) business partner noted that she didn’t want to run the store and that she didn’t want to own one unless I was the one operating it. 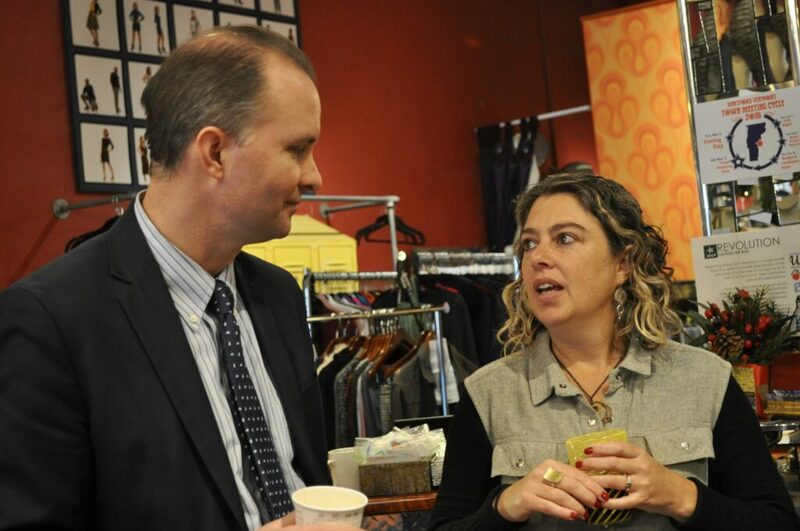 She recognized my entrepreneurial enthusiasm and my willingness to step up to the challenge of evolving a little consignment shop into something special. On a similar note, I said that if they were expecting some great financial return on their investment, we should probably skip the endeavor, but if they were interested in investing in a genuine sense of community, then we could do great things together! They opted for the latter and we have strengthened the community in many ways since. Over the years, it’s been fascinating to watch the changes in the Town of Hartford. My willingness to stay anchored on the corner of North Main Street has inspired others to consider dipping their entrepreneurial toe into the White River Junction commercial waters. 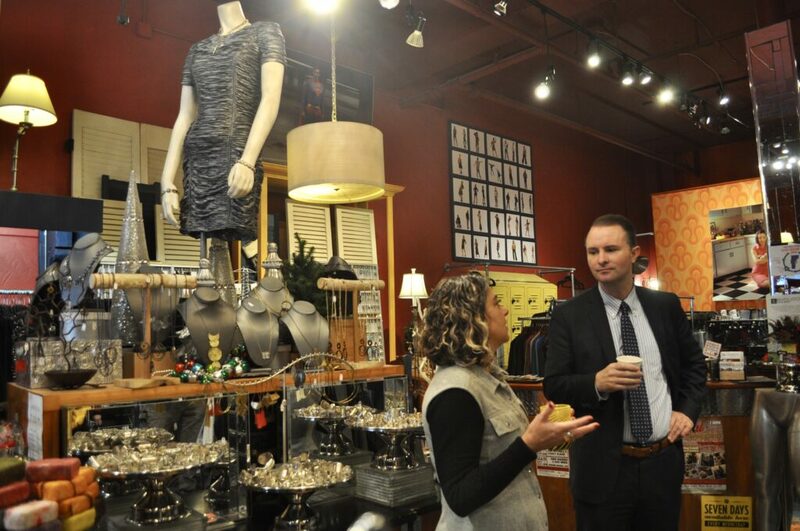 I recently did an informal count of over two dozen woman-run businesses, just in the downtown White River Junction area. To me, that’s amazing! It’s true what they say…. Artists will go where the rent is cheap. The artists make the landscape more interesting and attractive. Then, the developers come in, build and gentrify, and then the artists can no longer afford to live there. I’d like to think that Hartford values its arts community and recognizes that keeping our village centers affordable and accessible is a priority in economic development. Being on a first name basis with at least five of the developers in our area is something worth noting. They are accountable to their community because they live here, and they too appreciate this quality of life. What are some of your goals for the coming year in terms of your work in the community? I’m always interested in healthy and equitable economic development. We are fortunate in the Town of Hartford to include five distinct villages which complement each other in terms of their residential/rural character and connectedness to industrial and commercial areas throughout the Upper Valley. In 2019-20, I’ll be focused mainly on infrastructure improvements within the downtown White River Junction area in order to attract more independent businesses and accessible affordable housing. We’re implementing plans and funding for improved distribution of water, wastewater and sewer in the downtown area, and funding preliminary engineering studies for increased parking capacity. I will continue to seek input from our most vulnerable community members and be sure that their wellbeing is considered each time decisions are made in the context of our municipal accomplishments. My immediate goal as a business owner is to increase our exceptional team of employees to allow me to spend more time working with grassroots organizers and take advantage of educational opportunities to become a better citizen. What are ways small businesses can be better supported by state government? Capital, capital, capital! I’m not sure if state government has the answers but bridging the gap between folks with resources and folks with the ‘fire in the belly’ kind of spirit that it takes to really cultivate a culture of Vermont business is something that I think could be less rare. Sure, there are venture capitalists and networking opportunities, but somehow I envision a platform through which investors (such as the family who reached out to me) and entrepreneurs could engage and form relationships that are mutually beneficial, even if not financially lucrative. Community Investors, so to speak. Idealism is both my strength and my weakness! What advice do you have for others looking to start a small business? Start a small business only IF IT’S SOMETHING THAT YOU LOVE DOING. In my business, it’s not about pop culture or fashion trends. I couldn’t care less about those things. For me, it’s about inviting people in to my beautiful space to drink tea, try on clothes, and make genuine connections. I feel very lucky to be here.